Once upon a time, there was a young girl named Cinderella. She lived with her stepmother and two stepsisters. The stepmother and stepsisters were conceited and bad-tempered. They treated Cinderella very badly. Her stepmother made Cinderella do the hardest works in the house; such as scrubbing the floor, cleaning the pot and and preparing the food for the family. The two stepsisters, on the other hand, did not do the housework at all. Their mother gave them many beautiful dresses to wear. One day, the two stepsisters received an invitation to the ball that the king's son was going to give at the palace. They were excited about this and spent so much time choosing the dresses they would wear. At last, the day of the ball came, and the stepsisters went away to it. Cinderella could not help crying after they had left. "Why are crying, Cinderella?" a voice asked. She looked up and saw her fairy godmother standing beside her. "I'm crying because I want to go to the bal so much," said Cinderella. "Well," said the godmother, "You've been a cheerful, hardworking, uncomplaining girl that I'll make sure you do go to the ball." Magically, the fairy godmother changed a pumpkin into a fine coach and mice into a coachman and two footmen. Her godmother tapped Cinderella's dress with her wand, and it became a beautiful ball gown. Then she gave her a pair of pretty glass slippers. "Now, Cinderella", she said, "You must leave before midnight." Then away she drove in her beautiful coach. Cinderella was having wonderful time. She danced again and again with the prince. Suddenly the clock began to strike twelve, she ran toward the door as quickly as she could. In her hurry, one of her glass slipper was left behind. 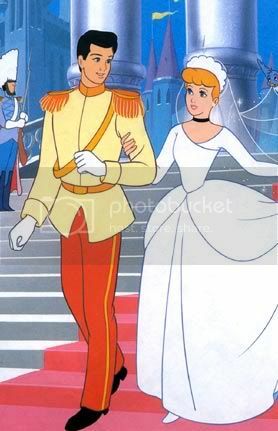 A few days later, the king's son proclaimed that he would marry the girl whose feet fitted the glass slipper. Her stepsisters tried on the slipper but it was too small for them, no matter how hard they squeezed their toes into it. In the end, the king's page let Cinderella try on the slipper. She stuck out her foot and the page slipped the slipper on. It fitted perfectly. Finally, she was driven to the palace. The king's son was overjoyed to see her again. They were married and lived happily ever after. This text is taken from Students' Workbook for SMA XI.